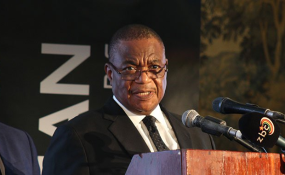 Vice president Constantino Chiwenga is hospitalised in South Africa, the presidency admitted Monday, adding that he was expected to return home this week. Chiwenga, who led the November 2017 coup which ousted long-serving ruler Robert Mugabe, was the subject of fervent social media speculation over the past week amid reports he was critically ill.
Reports claimed he had been rushed to South Africa at a time foreign affairs minister Sibusiso Moyo - who fronted the coup in the media - has also not been seen in public for three weeks after being hospitalised at an upmarket private clinic in Harare. Recent images of Chiwenga and wife Mary have shown them with visibly swollen hands in addition to apparently losing their skin pigmentation. The vice president, who reportedly vomited during a recent cabinet meeting, travelled to South Africa last Tuesday accompanied by wife Mary and deputy health minister Dr John Mangwiro. "Both General Chiwenga and Amai Chiwenga are in good health," presidential spokesman George Charamba told the State-owned Herald. "They have been cleared except for some little problems that were detected and have since been treated. The VP is very well and when I chatted with him he ended up barking orders to me in respect of Kanyemba projects and in respect of the Bulawayo Kraal project in Binga. He added; "I said to him vakuru chimboteereraika muviri (tend to your body) and he said no, no Charamba. "He also told me of the plans he has because he was telling me that by harvest time this coming season we should never have any difficulties with cooking oil. "So, uppermost on his mind are projects which are meant to revamp our irrigation infrastructure. Barring the unforeseen, we expect the couple back into the country sometime this week." According to Charamba, the medical review was related to injuries Chiwenga and wife sustained in the June bomb blast at Bulawayo's White City Stadium. "General Chiwenga and his family were affected by the White City bombing incident," said Charamba. "It happened in the middle of elections, so it was not possible for him to go for a thorough medical examination. After the elections, we had the pressure of forming a new Government and again he couldn't go out for that examination. "His wife, as you may be aware, went for medical treatment alongside other officials. A decision was then taken that now that elections are behind us, and also that the new Government has been constituted, the General should now go for a thorough medical examination. "So, he flew out last Tuesday alongside his wife who was also due for a review in South Africa where they then went for medical checks. And in the case of the wife, it was a review." Chiwenga, a liberation war veteran, also has a historic health complaint from the independence war. "Apart from the White City Stadium injury, the General was injured towards ceasefire in the Chiduku area in Hwedza and for a long time he had a bullet lodged in his lung," said Charamba. "There is that historical problem yavagara vainayo (which he has always had) over and above what happened at White City Stadium. "That then made it urgent for him to then get that thorough medical attention I am talking about."